Powered by four medium-speed diesel and two controllable pitch pro- pellers, the as-yet-unnamed ship will operate out of the United Kingdom under the Red Ensign. Canberra. Her outdoor deck area, at two and a half acres, will be one of the most spacious of any cruise ship afloat. The new ship will be fast, with an operating speed of 24 knots. Her speed, aided by a technically ad- vanced hull design, will enable her to operate one of the best and most far-reaching itineraries worldwide. Southampton, when the new ship enters service in April 1995. Artist's conception of the new 67,000-ton P&O superliner, which will be built by Papenburg, Germany- based Meyer Werft. What are you looking for in vapor control valves? Easy installation? Low installation cost? Easy mainte- nance? Compactness for tight spaces? No matter. The MMC line includes just the valve you need. And you can count on us to help you meet the latest USCG and other applicable regulations. Micro B has 2" Hanged end for positive shutoff, 316 stainless steel construction with Teflon seats and seals. Model U fits directly on existing ullage hatch, requires no hot work for installa- tion, no staging, no gas freeing of tanks. 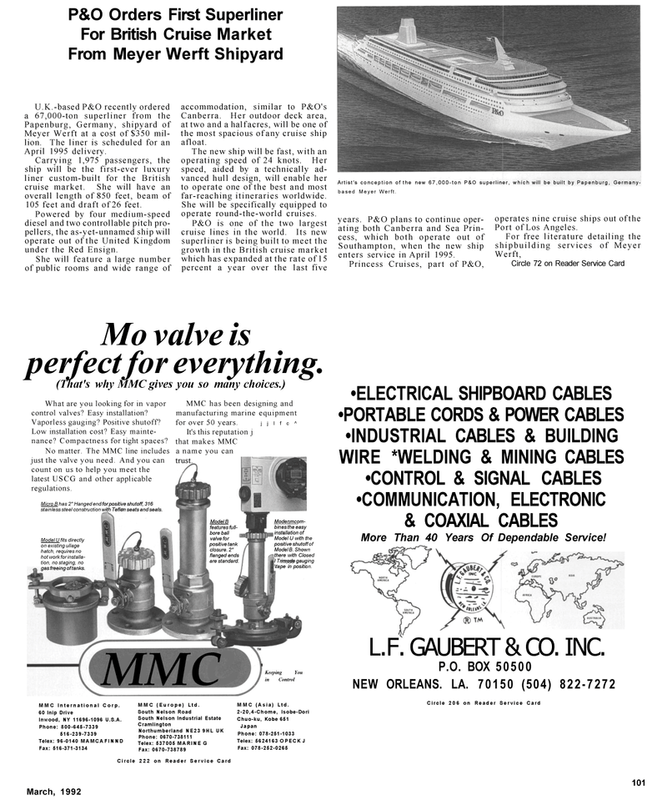 MMC has been designing and manufacturing marine equipment for over 50 years. I Trimode gauging \tape in position. features full- bore ball valve for positive tank closure. 2" flanged ends are standard. More Than 40 Years Of Dependable Service! L.F. GAUBERT & CO. INC.